FindMyLawTutor is flat rate shipping in the United States. Prices include shipping and handling. 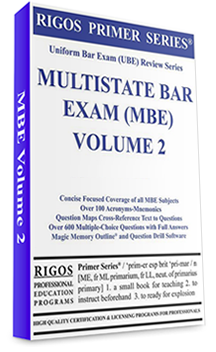 Our comprehensive review course material is all you need to pass the MBE administered by the National Conference of Bar Examiners (NCBE) as a part of the Uniform Bar Exam (UBE). This Rigos Review Series MBE text and questions are presented in two volumes. Volume 2 contains the four subjects of Evidence, Constitutional Law, Criminal Law and Procedure, and Federal Civil Procedure. Magic Memory Outlines, question maps, multiple-choice questions, and answers cross-referenced to the textual coverage are included. What is included in this book? This book presents succinct explanations of the most frequently tested MBE black letter law principles without overwhelming you with unnecessary concepts or depth. Also included are hundreds of acronyms-mnemonics, tips, and solution approaches to help you easily memorize elements covering frequently asked legal concepts. We offer “Magic Memory Outline”® to assist you in synthesizing and summarizing the law in your own words. The learning questions with complete answer rationales within each chapter helps reinforce learning as you go, so that when you reach the more difficult practice questions, you are more confident. Furthermore, there are more than 1,450 multiple-choice exam questions with full answer rationales. Also, the two mock 3-hour/100-question practice MBE-patterned exam sets allow you to simulate and test yourself in an actual MBE experience. Our “MBE Secret Weapon”™ patent-pending proprietary technique provides subject focus, maximum exam efficiency, less time stress, and more correct answers. Copyrights © 2019 Find My Law Tutor, All Rights Reserved.